Let’s start with a story called Military Inspection. The colonel who served as inspector general in our command paid attention to how personnel wore their uniforms. On one occasion he spotted a junior airman with a violation. “Airman,” he bellowed, “what do you do when a shirt pocket is unbuttoned?” The startled airman replied, “Button it, sir!” The colonel looked him in the eye and said, “Well?” At that, the airman nervously reached over and buttoned the colonel’s shirt pocket. A good example is far better than a good precept, isn’t it! Most people talk on principle but act on their own interest. In these days we are being bombarded with so many problems in nations, finances, and governments, I thought it might be beneficial to investigate what God looks for in a leader and what kind of leader God endorses for a nation, city, or precinct. Politics has been defined as the art of making your own selfish interest seem like the national interest. Keep that in mind as you go to the polls. There are two things I see in this verse on why God chose David to be the leader of the nation. David had the humility to understand God put him in a leadership position of great authority. But he also realized that with privilege comes responsibility. He was there for the sake of all God’s people. He realized he was a steward, not the owner of the nation. He was given leadership by God for all people in his constituency, not just a loud outspoken few. Why? God loves everyone. God loves people you like. God loves people you don’t know. God loves people you don’t like. God even loves people you hate. A good leader must have the bigger picture in mind than their favorite theme or cause. All candidates and especially a ‘king,’ should understand the position they were elected to and serve in is for others, not themselves. For example, if they are elected mayor, they must realize the city is not there for them, they are there for the city. As a mayor, the city must not be used as a means to his or her ego-driven end or agenda. Politicians should understand there are two areas they need be aware of. There are areas of influence and areas of interest. Let’s say one is a representative. They are called to represent the people in their constituency. That is an area of influence. You represent your area. But there are also areas of interest. Areas of interest are issues that affect your area of influence. For example, the economy affects everyone and is your area of influence. Most politicians are so focused on their area of influence they disregard important and necessary of interest. The more focused you are, the less aware you become. That can ruin a nation. Let me ask you a question. Why couldn’t all the king’s horses and all the king’s men put Humpty Dumpty back together again? Perhaps it’s because they didn’t ask the King. Let’s get a little wisdom from the King on putting our communities, cities, and nation back together again. Maybe it’s time to start looking for leaders and leadership like David rather than having an emotion-based popularity contest based on who raised the most money to run negative commercials against the other candidate. 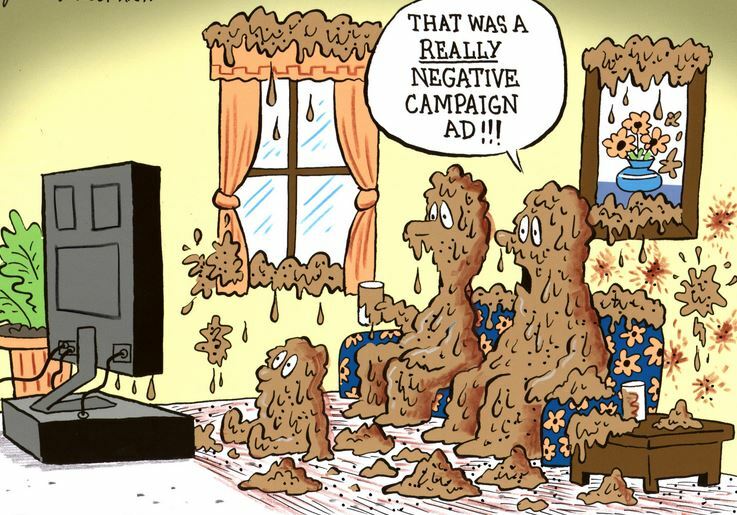 The purpose of negative ads is to get people hating the other candidate. It activates their base. Why? You don’t think when you hate. You emote. Throwing mud is just losing ground. It’s not good leadership either.